A recent assessment of the completion date for the first Space Launch System (SLS) Core Stage now puts it at the end of May, 2019, close to the middle of next year. The date indicates that production and assembly schedules are still sliding and is reducing confidence in meeting the June, 2020 date that was at the late end of NASA’s schedule forecast for the Exploration Mission-1 (EM-1) launch. EM-1 is the first integrated launch bringing together NASA’s Exploration Ground Systems (EGS), Orion, and SLS programs. The space agency has kept December, 2019 as the launch readiness date in their EM-1 schedules since they were revised again last year, stating there was as much as six months of risk to that schedule. The May, 2019 forecast completion date for the Core Stage would mean most of that schedule risk has already been realized before a stretch of critical integrated testing can begin with the Stage “Green Run” campaign. Recent notes shared in L2 indicate that the Element Acceptance Review (EAR) for Core Stage 1 (CS-1) is now forecast for May 29, 2019, about one year from now. The EAR is a review conducted after completion of work to approve its readiness for shipment. 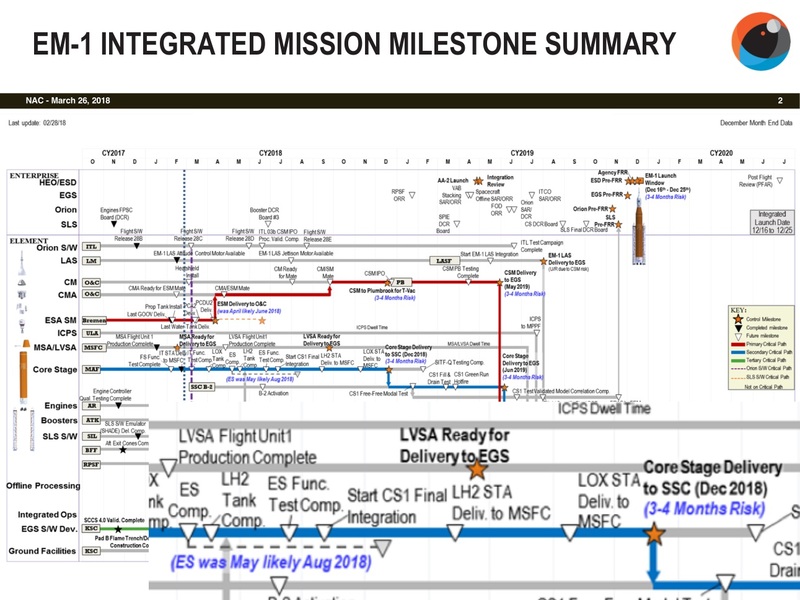 Revisions of the “Integrated Milestone Summary” chart for the EM-1 launch shown by NASA officials have put CS-1 completion at the end of 2018 for December, 2019, launch “readiness” date. EM-1 is a lunar orbit mission with launch windows that last about a week and a half during each month, so the vehicle could be ready at a time when it can’t get Orion to the Moon and would have wait until the next monthly window. NASA officials have noted that the schedules for the critical path items such as the Core Stage have no margin in them, making it difficult to hold the end of the schedule when interim milestones are delayed. Construction of the first SLS Core Stage and Orion’s first European Service Module (ESM) have consistently been in the schedule’s critical path, taking the longest to complete and dictating when later phases of hardware work and testing can start. 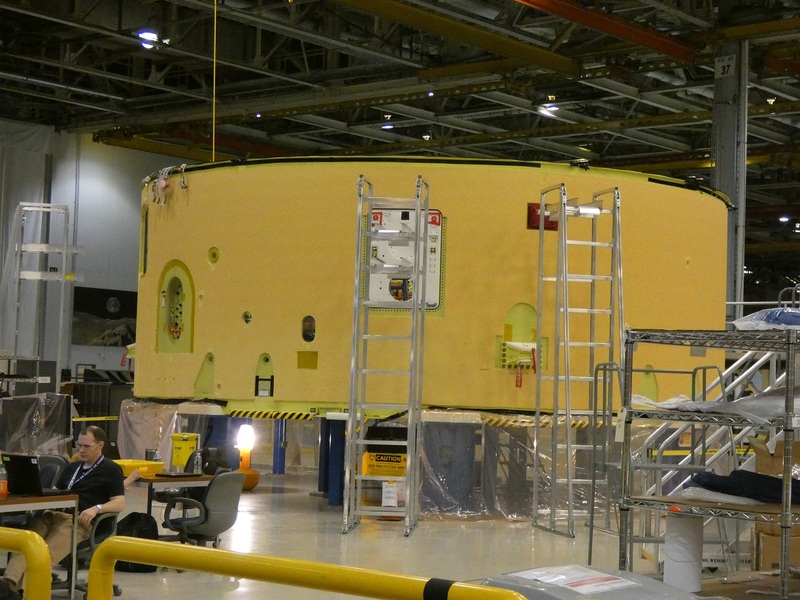 CS-1 is currently under construction at NASA’s Michoud Assembly Facility (MAF) in New Orleans. It is short of final assembly, with individual processing of the five main elements still underway. The May, 2019, CS-1 completion date appears to be a couple of months behind the most recent public assessment of one of those critical interim milestones. Within the construction work at MAF, the internal CS-1 critical path has been completion of the engine section element. At the late March meeting of the Human Exploration Operations committee of the NASA Advisory Council (NAC), Exploration Systems Development (ESD) Deputy Associate Administrator Bill Hill indicated that completion of the engine section, which was scheduled for May or June more realistically appeared to be in August, a delay of three months. CS-1 engine section as seen in late February, 2018, at MAF. Work to add and fully integrate propulsion system elements inside was viewed as the critical path for completion of the stage. Credit: Philip Sloss for NSF/L2. “On the schedule today it still says ‘May/June’ but we’re projecting it may be August, so that’s a couple of months risk and we’ll see how that works out,” he said on March 26. ESD is having a Quarterly Program Status Review (QPSR) this week and it is expected that recent schedule assessments such as the May, 2019 CS-1 completion date will be discussed, along with re-evaluating the EM-1 launch date. It is unknown if the additional time for completion of final assembly of the whole rocket stage is based on the engine section, the other four elements, or continuing refinement of forward work. Most of the hardware and systems that will fly on EM-1 are being built for the first time and the procedures to connect the five pieces of the Core Stage together will also be attempted for the first time. Of the five elements, the most recent news had the Forward Skirt near completion of its individual work by the end of the month. Work to cover the liquid oxygen tank with its Thermal Protection System (TPS) foam was in final phases, with the liquid hydrogen tank to follow behind it. The engine section and intertank elements continue to be outfitted with propellant lines, pressure tanks, avionics boxes, wiring, and other equipment. Once complete, the elements will be assembled vertically in two stacks before a horizontal join of the halves of the rocket kicks off final assembly. CS-1 forward skirt in work stand at MAF in late February, 2018. This is the first element that is near completion. Once declared “ready to stack,” it will wait for the LOX tank and intertank. Credit: Philip Sloss for NSF/L2. Another indication that the December, 2019 readiness date is sliding is that detailed flight analysis work is on hold. The first EM-1 flight readiness analysis cycle, called FRAC-0, was supposed to begin soon for a December 16, 2019 launch date. The first iteration of the cycle was scheduled to start 19 months before launch as part of the overall mission analysis work that goes on in parallel with hardware assembly and in this case the other development work being done across the three programs. Engineers getting ready to work on this phase of detailed flight analysis were told to wait for more guidance before starting. Until recently the ESM and Core Stage were running “neck and neck” as the most critical paths in the overall schedule. Shipment of the Flight Model-1 (FM-1) ESM from prime contractor Airbus Space’s final assembly plant in Bremen, Germany, to the Kennedy Space Center (KSC) in Florida is currently forecast in the July time-frame. It has been delayed in the past, but at the late March NAC meeting Hill also said that the schedule had been tracking more solidly. The last of four propellant tanks is lifted for install into ESM FM-1 in March, 2018. Credit: Airbus Defence and Space. There is still a lot of integrated testing ahead for both Orion and the Core Stage, with further possible challenges when they get there. At a recent media event at Johnson Space Center in Houston, Annette Hasbrook, Assistant Integration Manager in NASA’s Orion Program, noted there’s long calendar of work after the ESM arrives in Florida. “Once that arrives, we have a 404-day timeline…from the time we bring it in to the time we turn it over to ground systems (EGS) at Kennedy Space Center for final integration onto the SLS rocket for launch,” she said during a media briefing at the event. 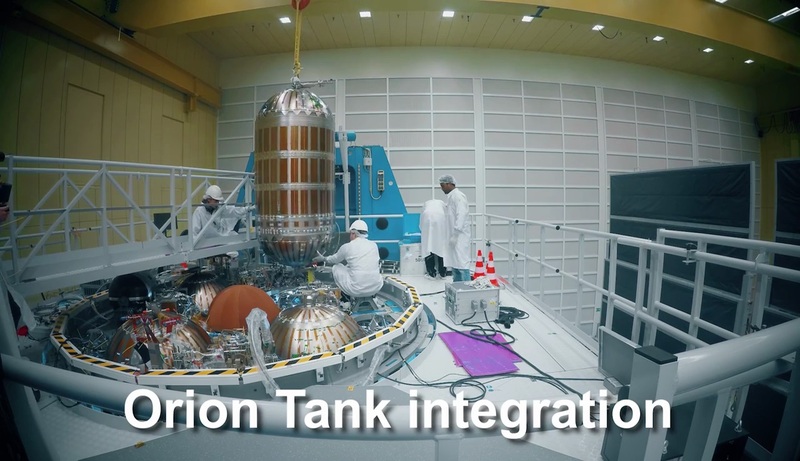 Once the Orion crew module and service module elements are assembled, like the Core Stage they will still have a significant amount of first-time integrated testing to do. “It takes about six months to do all the stacking and then we’ll do some integrated checkouts at KSC before we ship it up to Plum Brook,” she added after the briefing. The assembly will go through acoustic, vacuum chamber, and electromagnetic interference testing at Plum Brook Station at NASA’s Glenn Research Center in Cleveland. Once the testing is complete, the spacecraft can be returned to KSC to begin final launch preparations. 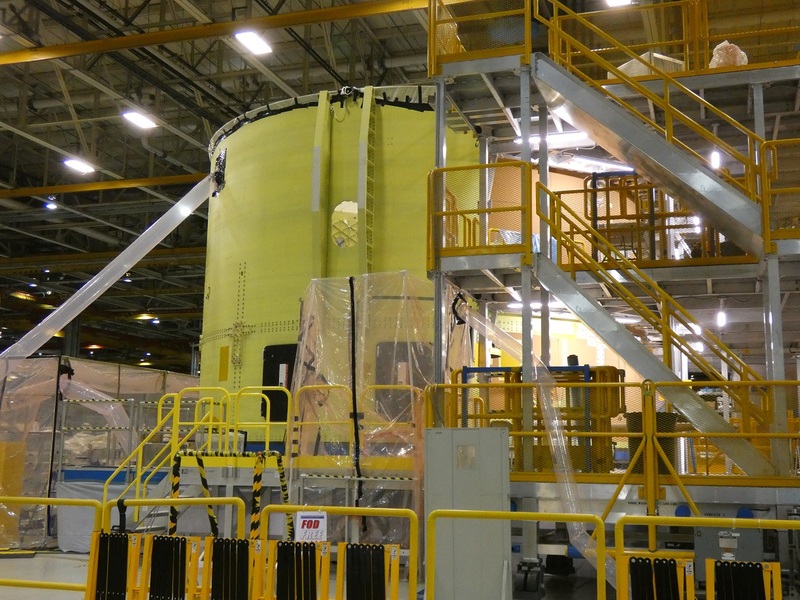 As with the ESM, completion of the Core Stage at MAF leads into the Stage “Green Run” integrated test campaign at Stennis. It is expected to take about six months to complete. The “Green Run” itself is an eight-minute long, mission-duration static firing of the Core Stage in the B-2 test stand at Stennis. The test firing itself will serve as an acceptance test for the integrated Core Stage, demonstrating that most of its systems can execute their part of the launch, maintaining hundreds of operating parameters within required ranges through critical sequences of fueling, terminal countdown, ignition, and eight minutes of mainstage engine operation. 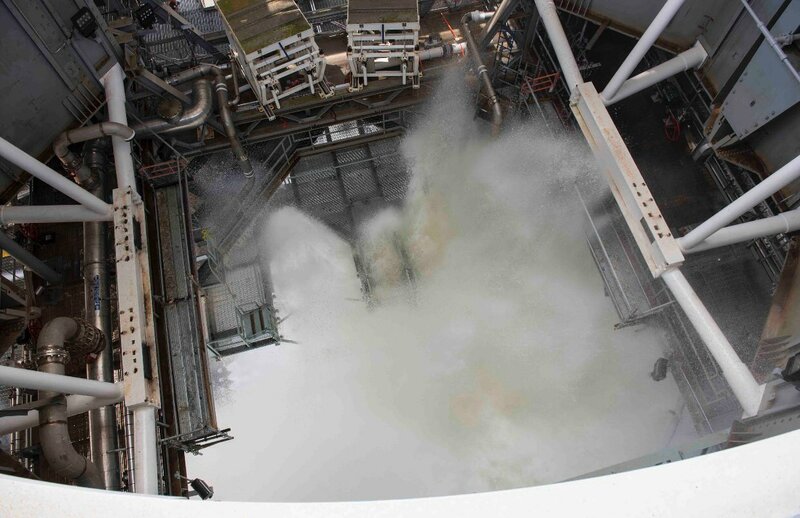 Recent water flow test on the Stennis B-2 test stand that will be used for the Core Stage Green Run. Mechanisms for the two umbilicals that will attach to the bottom of the Core Stage are seen top middle. Credit: NASA Stennis. Although the four RS-25 engines that will be installed in the stage have flown multiple times on Space Shuttle launches, almost everything else about the Core Stage is new and the test-firing itself will occur towards the end of the stay at Stennis. Before that can happen, the stage will be put through simulated countdowns and wet dress rehearsals to verify it is ready to run, making sure nothing leaks and everything works acceptably before committing to ignition. After the test firing the stage will be refurbished at Stennis, with inspections of the propulsion system and TPS, along with work to repair damage to the TPS foam and cork that might occur during the test.